You can rearrange tiles on the Windows 10 Start screen by dragging them to different places. You also can group similar tiles together in whatever groups make sense to you. On the Start screen, drag the Calculator tile to a different location. As you move the tile, other tiles move out of the way, like a game of Dodge Tile. To start with, the Start screen places tiles in one of two groups: Life at a Glance and Play and Explore. You can find these group names at the top of the start screen. Tap or click the words Play and Explore to change the name of the Play and Explore group. A text box appears, as shown. Enter a new name here (or keep the old name) and press Enter. Create a new group for Calculator by dragging the Calculator tile to the right of all the other tiles. Drag Calculator as if you were dragging it off the right side of the Start screen. Two horizontal lines appear after you stop dragging, as shown here. Tap or click the two vertical lines and you see a text box, as shown in the middle of the figure. You just created a new group with Calculator as the only tile. Type a name for the group into the text box, as shown in the right image in the figure. You can change the name at any time by repeating Steps 3 and 4. To remove the name, select the X to the right of the text box. 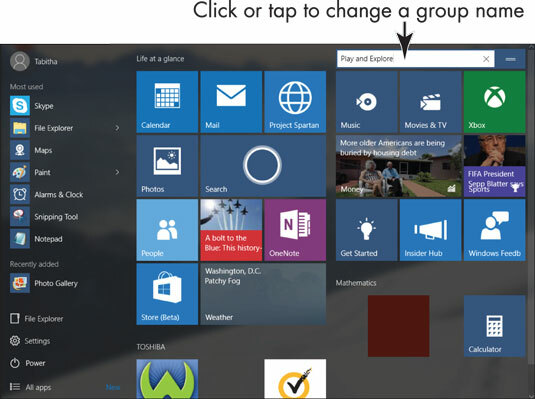 Create groups to organize app tiles on the Start screen. 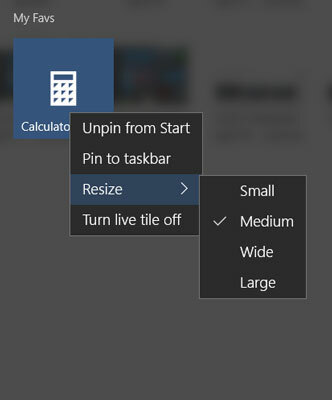 Change the size of the Calculator tile. On the context menu, select Resize and then select the Wide option on the submenu, as shown. (The options you see on a touchscreen are the same, but are arranged differently on the context menu.) As well as the Wide, Medium, and Small options, Windows 10 provides a Large option for some tiles. Choose the Large or Wide resize option for apps you use often. The larger the tile, the easier it is to find on the Start screen. Locate a tile on the Start screen that doesn’t need to be there. Then select the tile and select Unpin from Start on the context menu to remove the tile from the Start screen. The Start screen becomes more useful and personal when you eliminate tiles that you don’t need and arrange tiles to suit your sense of order.